Fleet managers in the 3PL sector have a unique challenge. As well as the hectic requirements of day-to-day fleet management, there’s the extra pressure of ensuring that the client is represented properly, that their KPIs are met or exceeded, and that value for money is being demonstrated at all times. A tyre and weight management system can play a vital role in ensuring clients are well looked after, and can optimise and simplify this crucial element of fleet management. Keeping tabs on tyre pressure and vehicle weight can be complex, but the risks of not doing so are high. As well as the obvious risk to road safety, a roadside blow-out costs valuable time, can affect driver hours, write off the load, damage the vehicle, disrupt traffic, and result in significant recovery and repair cost. Likewise, a vehicle failing inspection by the DVSA for underinflated tyres or overloaded axles can be served with an immediate prohibition notice and fines or court summons imposed. These are all big risks for any transport operator, and can be even higher for 3PLs who have client KPIs and brand reputation to protect. The most recent UK Department for Transport figures show a drop in the number of HGV incidents where vehicle defect was the cause, from 140 in 2011 to only 97 in 2015 – a reduction of over 30% in just 5 years. However, of these incidents, almost 20% were due to defective, illegal or underinflated tyres in 2015. This compares to less than a tenth in 2011. So, whilst it’s great news that vehicle condition in general is improving and contributing to greater road safety, tyre condition has not advanced in the same way. It’s a similar picture for incidents where poorly loaded or overloaded vehicles were the cause: in 2015 over half of all vehicle condition-related incidents were due to loading issues, a figure that has remained static over the past few years. The everyday risks of running a large fleet can only be controlled so far. There’s an inevitability that tyre-related incidents will happen, but there are simple steps that can be taken to reduce this particular risk to a minimum without adding any extra manual process. Underinflated tyres are easy to miss on daily walkaround checks as inner tyres aren’t easily visible, and underinflation of any tyre isn’t always obvious without a pressure check. Likewise, without axle-weighing devices overloaded axles can easily be missed. But the increased risk of a blowout and the negative effect on fuel consumption and tyre wear make regular, accurate tyre pressure and load checking an essential part of fleet management. The industry standard is for tyre pressures to be manually checked once every 6-8 weeks. This method is very time consuming, open to human error, and too infrequent to identify slow punctures. It also relies on all vehicles being available at the point of inspection. A fleet of 100 HGVs could consist of around 1500 tyres, each needing to be checked manually. On-board TPMS for trucks involves a mechanical device being installed in each wheel, adding to costs and maintenance, whilst increasing the complexity of the vehicle and giving the driver another task. Larger fleets would potentially need to have thousands of individual devices installed and maintained. 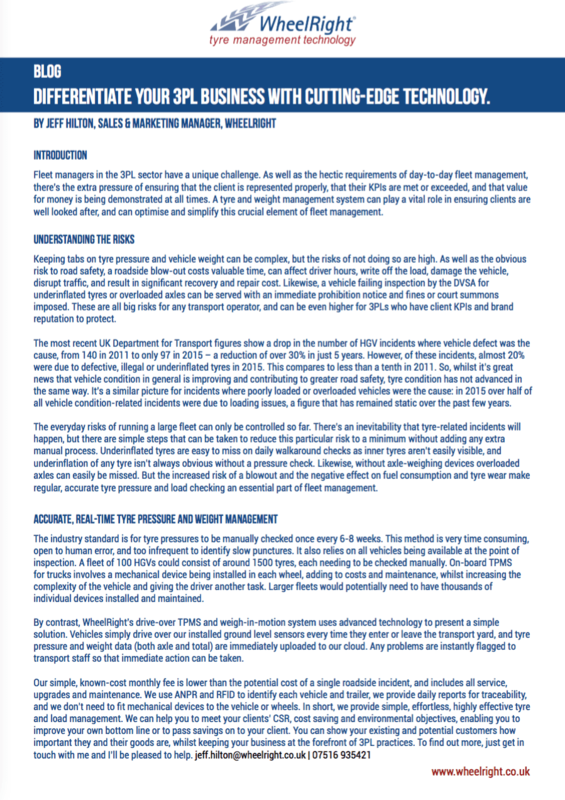 By contrast, WheelRight’s drive-over TPMS and weigh-in-motion system uses advanced technology to present a simple solution. Vehicles simply drive over our installed ground level sensors every time they enter or leave the transport yard, and tyre pressure and weight data (both axle and total) are immediately uploaded to our cloud. Any problems are instantly flagged to transport staff so that immediate action can be taken. Our simple, known-cost monthly fee is lower than the potential cost of a single roadside incident, and includes all service, upgrades and maintenance. We use ANPR and RFID to identify each vehicle and trailer, we provide daily reports for traceability, and we don’t need to fit mechanical devices to the vehicle or wheels. In short, we provide simple, effortless, highly effective tyre and load management. We can help you to meet your clients’ CSR, cost saving and environmental objectives, enabling you to improve your own bottom line or to pass savings on to your client. You can show your existing and potential customers how important they and their goods are, whilst keeping your business at the forefront of 3PL practices. To find out more, just get in touch with me and I’ll be pleased to help.